Funding For Playgrounds: How Can We Raise Money? Various businesses and organizations, ranging from daycare centers to YMCAs to places of worship, across the country have raised significant amounts of money for playgrounds. Playground funding goals include anywhere from a few thousand dollars for playground maintenance to $40,000 to $80,000 for a complete playground build. 1) Have a plan or design in place. Donors want to make sure their money is put to good use and they’re more likely to take your request for funds seriously if you can show that you have a carefully thought out plan. If you’re building a playground at a daycare center, for example, you could show them the playground location/venue and discuss the types of equipment that you might need. Even a simple drawing of what the finished playground will look like can spur donations. Make sure you have planners, calendars and a system for keeping track of all grant applications, playground funding ideas and financing opportunities. Keeping everything in one system will ensure you don’t overlook a key deadline or opportunity. Because securing funding for a playground is an extensive project, you might consider utilizing a group of volunteers. You may need to have separate people or committees to contact prospective donors, research grant opportunities and write grant applications. Give everyone a job, making sure the people you appoint are the best ones for that position and they understand their deadlines and goals of the project. You’re going to need an account to keep the funds safe and in one place. Depending on your needs, you may want to open a savings account so the money earns interest while you raise additional funds. Alternatively, the money can be placed into an escrow or checking account. In addition to a bank account, you will need a system to keep track of donations. That way, you can stay on track for your target and properly acknowledge everyone who donates. You need a plan to make sure volunteers, workers and the community around you continue supporting the playground project, even if it takes months or years to raise the money. How will you maintain energy? How will you keep people interested in the playground? You may want to send out a monthly e-newsletter informing people of playground-related efforts and to keep them excited. You may also want to set up a display outside of your place of worship, daycare or YMCA to show donors how much money has been raised to date. All the systems are in place. What next? How do you actually raise money for the playground? Grants are a great place to start. Grants are funds – that do not need to be repaid – offered by corporations, nonprofits and foundations for specific types of projects. They can range from a few hundred to several thousand dollars, helping get you closer to your target. There are many grants designed for child-based activities and community-based projects. A playground at a church, YMCA or daycare could meet the requirements for these types of grants — you’ll just need to find them to start applying. Playworld has a handy guide to grants that includes recommendations and suggestions on locating additional grants. 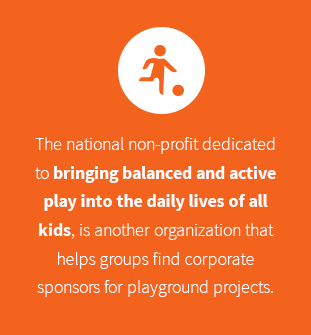 KaBOOM!, the national non-profit dedicated to bringing balanced and active play into the daily lives of all kids, is another organization that helps groups find corporate sponsors for playground projects. In many cases, corporate sponsors listed on KaBOOM!’s website offer money to child-supporting nonprofit organizations, which means places of worship and YMCA may be able to find grants through its database. Even if you’re a for-profit daycare, however, there may be grants available to you on the database. Always carefully research donors and foundations to find out what they want to accomplish with their grant money. When writing your grant applications, carefully explain how your playground project will be part of that mission. For example, if an organization wants to improve fitness in communities and your planned playground is slated to include a space for physical activity in a neighborhood where such opportunities are few, highlight this with information and include specific statistics or numbers, if possible. Emphasizing how your playground will serve others and will help the donor meet their own goals increases the chances of your grant application being successful. Multiple groups compete for funding, so don’t get discouraged if you receive some rejections. The best way to increase your chances of success is to write the best grant applications you can for as many grants as possible. It can also be helpful to organize a grant-writing party, where volunteers gather together to apply for multiple grants at the same time. You can brainstorm as a team, take turns editing each other’s work and collaborate to build strong applications. The grant writing party can be a lot more engaging for your volunteers and can even be festive with some refreshments. You might be able to elicit more enthusiasm, stronger applications and more grant applications with this approach. Another option is to ask community members and local businesses for donations directly. If you are representing a place of worship, for example, consider mentioning your desire to build a playground during a service or at an event. Encourage members to come forward to donate. If some business leaders are part of your religious organization, they may be open to donating too. Similarly, if you work at a daycare, approach parents to ask for donations. 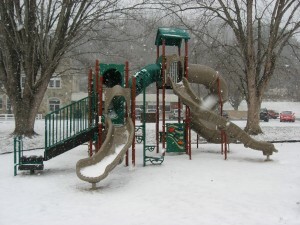 Since their children will benefit from having a playground on the premises, parents may be open to the idea of donating time or money to the project. Have something to offer. With businesses, especially, cooperation is more likely if the company gets something in exchange. As a YMCA, you may be willing to offer some free advertising for businesses in your lobby or free classes at the YMCA for individual donors. If you run a daycare, you may be willing to offer advertising on your website or on the playground itself. If you represent a place of worship, perhaps you can offer a small space for advertising at a local event you are hosting, or offering space on a custom sign located at the playground. 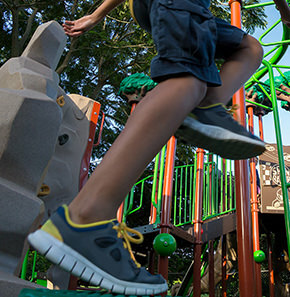 Understand the benefits of your playground. Make sure you can articulate exactly what the playground will offer. Will it give children a safe place to play in an area where there aren’t many green spaces? Is there a concern about sedentary lifestyles or childhood obesity in your area — and will a playground may be able to address some of those issues? Will a playground help to bring members of your place of worship closer together? 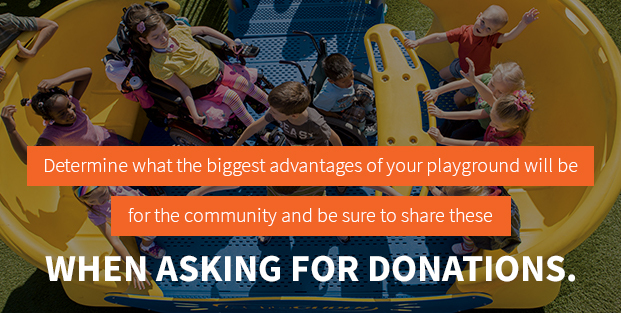 Determine what the biggest advantages of your playground will be for the community and be sure to share these when asking for donations. Make it personal. Approach donors directly each time. It can be tempting to send out mass e-mails or to send a general request. While these are certainly useful, don’t forget to approach people directly. Give people a chance to say no – but give them lots of reasons to say yes.Don’t use pressure, since it can be awkward if someone can’t or doesn’t want to give. At the same time, make it easy for people to say yes. Provide several ways for people to help. For example, ask for volunteers, donations of cash or prizes for a raffle. Give donors deadlines.It can be easy for people to put off donating until “later”. Provide a specific date range when you’re willing to accept donations or a specific deadline for donations. For example, simply stating “we’re accepting items for our raffle until July 16” nudges people to donate before that date so that they don’t miss the opportunity to contribute. Approaching people directly can help, but you can also leverage social media when asking for donations. Just post your requests on channels such as Facebook, Twitter and your organization’s blog and website. Include a button that lets viewers donate directly from these online resources. Crowdfunding encourages group donations to fund a larger project. If you look at sites such as GoFundMe, Indiegogo and Kickstarter, you’ll find people use crowdfunding to finance everything from independent movie projects to charitable campaigns to cash for their favorite non-profits. Crowdfunding lets you raise money online from all over the country or all around the world. The campaigns are easy to set up, and websites dedicated to crowdfunding can help you organize and even advertise your campaign. Today, crowdfunding is immensely popular, with more than $16 billion raised through this method in 2014. Nevertheless, it’s important to keep in mind that this method is not foolproof. Crowdfunding websites take a portion of the money you raise to pay for the platform. In addition, local laws about crowdfunding differ. You’ll need to consult with an attorney to make sure you’re compliant. To launch a popular crowdfunding campaign, you need to put in the same effort you would with any funding option. This is not free money. Successful campaigns have the power of a celebrity or strategic marketing efforts supporting them. Nevertheless, the average crowdfunding campaign earns about $7,000 — enough to make a big impact on your funding goals. Bake sales, auctions, raffles, garage sales and more are all excellent fundraising options. Most people like to buy, and these types of sales often mean great bargains for shoppers. If you’re on a budget, bake sales are a simple solution because everyone can prepare something and bring it in for the sale. If you’re willing to go from business-to-business to gather donations of items for raffles and auctions, these can also be extremely popular. Garage sales can be a great way for people in your community to clean out their garages and attics while helping you raise money. You can make items — such as keychains, dog leashes, jewelry or T-shirts — and sell them at your YMCA or daycare, at events or even online. If someone in your volunteer entourage knits or is crafty, homemade goods can also be a popular item to sell. Alternatively, you may be able to rent small machines to make personalized T-shirts, keychains or other small items for sale. You can even rent or buy 3-D printers to make custom designs, toys and other items. Events such as car washes, fairs and talent shows require “sweat equity”. You’ll need a group of volunteers to put on a show, arrange exhibits at a fair or do the hard work of washing cars in exchange for cash. The good news is many of these types of events aren’t expensive to set up and can bring in hundreds or even thousands of dollars. If you manage a daycare or place of worship, especially, children’s events are a great solution. Organize a family day or picnic, where everyone has to buy a basket to participate or teddy bear picnics are all fun for children while you raise funds. 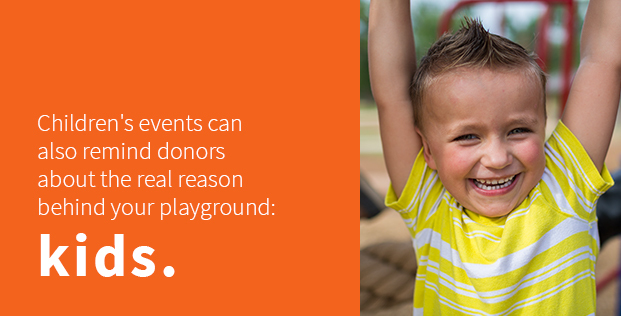 Children’s events can also remind donors about the real reason behind your playground: kids. Many companies offer out-of-the-box fundraising solutions for groups interested in raising money. For example, some companies organize chocolate selling campaigns, T-shirt campaigns or other similar programs designed specifically for schools, daycares, places of worship and other organizations interested in raising money for a specific project. Some local amusement parks, museums and even local zoos also have fundraising programs. The advantage of these programs is that they are often designed for new fundraisers. They include an idea, a marketing plan and other resources you can take advantage of to sell more items and raise more money. The company takes care of many of the details — you just need your volunteers or your community. These campaigns can also build trust because they are familiar. If you work with a local zoo or other company people know, for example, you may have an easier time raising money. The main disadvantage of these out-of-the-box programs is you’ll need to give a portion of the money you earn to the company. In addition, there may not be a lot of flexibility in terms of how to raise money. If you decide to seek an out-of-the-box solution from a company, make sure to do your due diligence. Find the right company by carefully researching and comparing programs. What experiences have others had with the program? What types of fundraising efforts have worked with this program and how much money was raised? Carefully look over the financials and agreements so you understand how much money the company will keep. Even if you try fundraising, grant writing, crowdfunding and other sources to raise capital for your playground, you may find you still need some financing in order to pay for your playground. 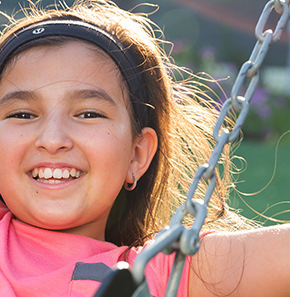 Leasing and financing allow you to realize your dream of a playground — even if your fundraising efforts fall short of the total amount of money needed. You can apply for financing through a bank or credit union. However, some financial institutions may be reluctant to offer a loan for a playground. Playworld does offer financing and leasing specifically for organizations interested in building a playground. Contact one of our representatives to find out how to make your playground a reality. Playgrounds, in many ways, are priceless. They help children build memories, encourage activity and socialization and make people happy. For YMCAs, places of worship and daycares, the playground can be an important way children can learn to become part of their communities. The money for building a playground doesn’t have to be an obstacle. Multiple fundraising and financing options will help you raise the money you need. If you’d like to learn more about the cost of building your playground and how to pay for the project, contact Playworld. As a leading provider of playground equipment with 45 years of experience designing and building playgrounds for places of worship, schools, daycares, YMCAs, community organizations and other groups, we know play spaces. We’d be happy to share our experience and help you understand what steps you can take to create a stunning play space for children in your community.